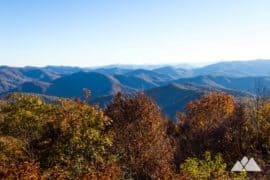 Winding, twisting, curving and carving through the landscape, the Blue Ridge Parkway travels some of Western NC’s most scenic terrain. 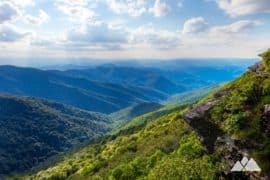 This 469-mile, all-American road meanders through Asheville, offering access to some exceptional high-elevation views from the overlooks peppered along its path. 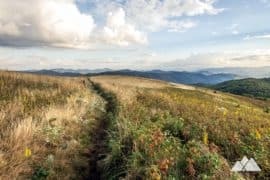 But if you’ve only experienced the Parkway for the drive, you’re missing out: scattered along the Parkway, trailheads lead to some seriously great hiking and running trails. Grab a hike or trail run to rushing waterfalls, through rolling forest, to lofty summits with see-forever views, and through grassy meadows filled with endless wildflowers and wild berries in the summertime months. 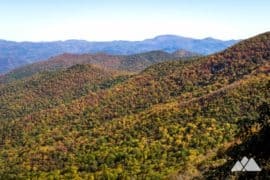 Thanks to its already-high elevation, most Blue Ridge Parkway hikes don’t have to venture far – making many of these hikes beginner-hiker-friendly, and some of our favorite hikes near Asheville. The Parkway follows a high ridge for much of its drive. Its high elevations make it perfect for spotting a spectacular sunrise or sunset near Asheville. 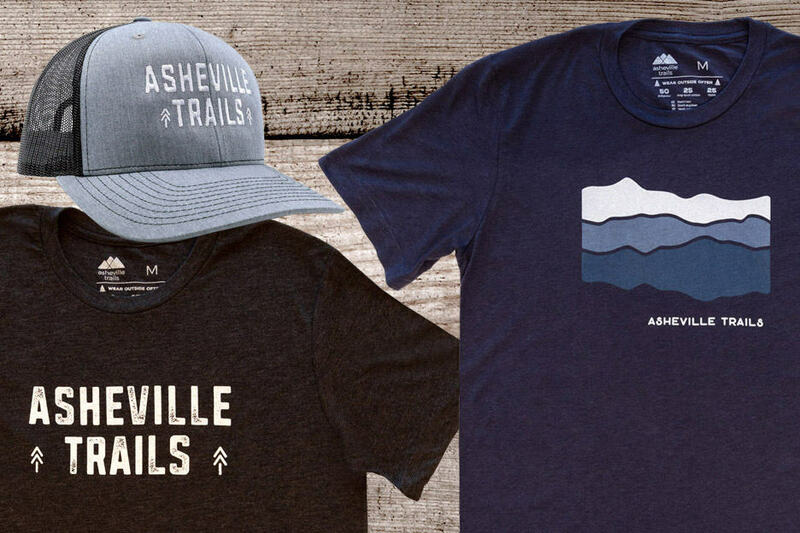 Elevations along the road are often much cooler than nearby Asheville, so pack a jacket, even in summertime, and dress in layers to stay comfortable on your hike. And before you go, check the official Blue Ridge Parkway website for road closures, especially in snowy winter months. For each hike, we’ve listed the Blue Ridge Parkway milepost (MP) number to help you get there – and each trail page includes driving directions, trail info, and interactive maps to help you plan your adventure. Grab your hiking boots, hit the Parkway and get ready for an adventure – and enjoy the spectacular drive to the trailhead, too. Hike to exceptional summit views at Rough Ridge, a rocky, jagged summit just off the Parkway on Grandfather Mountain’s lower elevations. 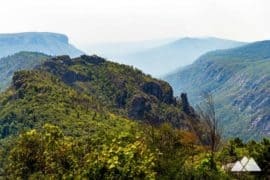 Follow boardwalks through stretches of extremely fragile, rare plant life, catching view after stunning view from the Rough Ridge rock outcrops. It’s a popular hike, so expect fellow hikers, but the views are simply unforgettable. 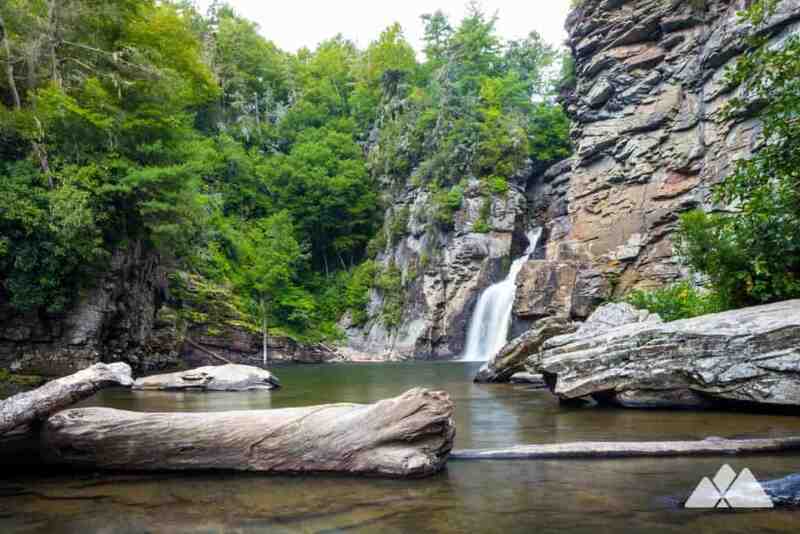 It’s one of our all-time favorite hikes on the Parkway. 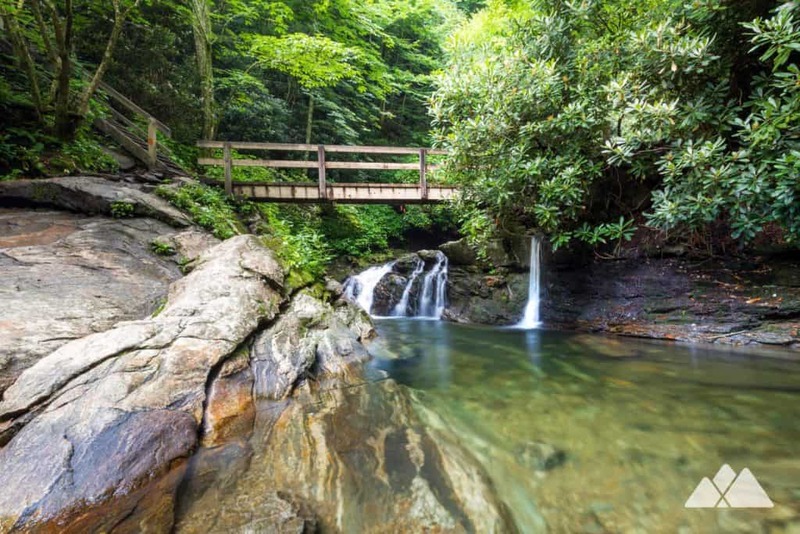 Catch stunning views from the rocky outcrops at Beacon Heights, and then follow the Tanawha Trail through a beautiful, mossy forest and dive beneath the winding, soaring contours of the Linn Cove Viaduct. 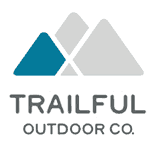 The hike scrambles through a rocky forest and reaches the large wooden bridge spanning Wilson Creek before doubling back to the Beacon Heights trailhead. 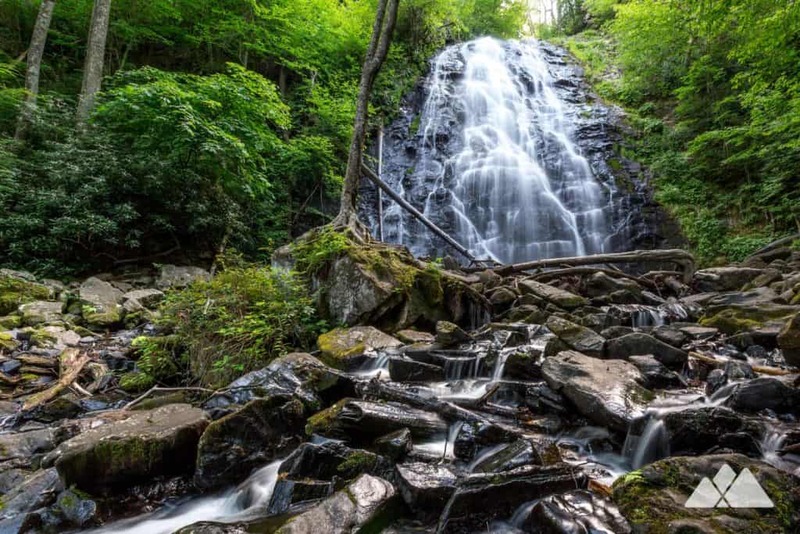 Hike to the towering cascades of Crabtree Falls, trailing through a lush, rocky forest filled with wildflowers, rhododendron and mountain laurel. 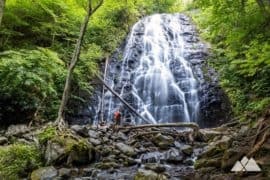 The trail also explores the smaller, yet equally beautiful, Upper Crabtree Falls upstream, and a shady creek valley peppered with broad-trunked hardwoods. It’s one of most popular waterfall hikes off the Parkway. 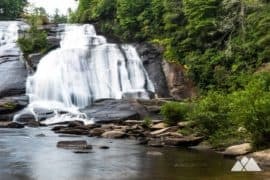 Hike to exceptional views of some of the best waterfalls near Asheville, trekking to three overlooks with views of upper and lower Linville Falls and some beautiful views into Linville Gorge. 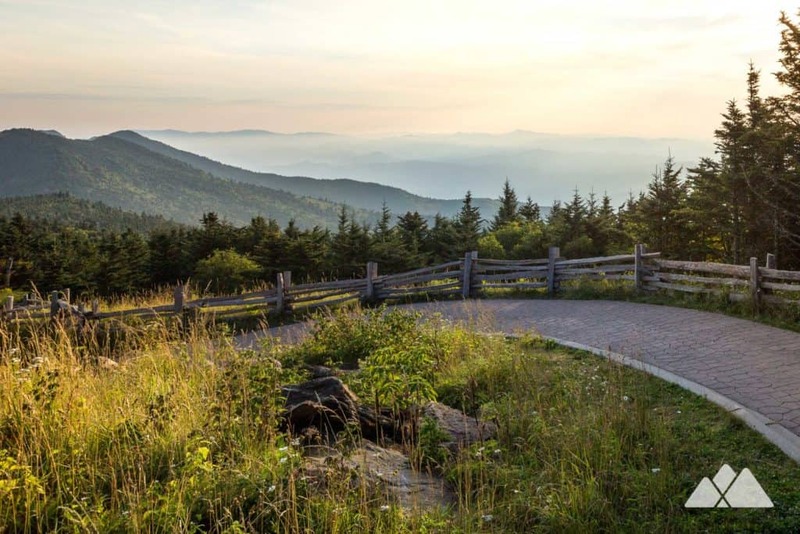 Hike a two-trail duo to the summit of Mount Mitchell, the tallest mountain east of the Mississippi, and through a gorgeous, shady forest filled with sweet-scented balsam fir. 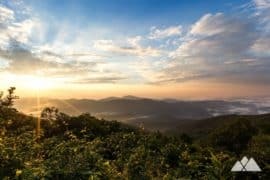 It’s a moderately difficult climb, but the views are well worth the effort: hike to the Mount Pisgah summit south of Asheville to catch some stunning long-range views. 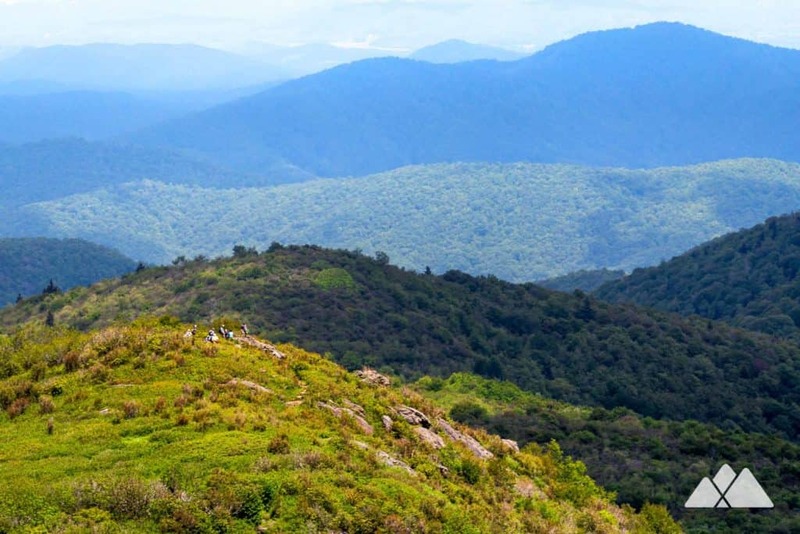 It’s a can’t-miss hike just north of Asheville: hike the Craggy Gardens Trail through a beautifully surreal, gnarled forest of rhododendron and blueberries to an idyllic, grassy mountaintop. 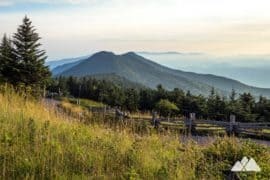 Hike the two tallest peaks east of the Mississippi River on the Deep Gap Trail, catching stunning high-altitude views along a ridgeline from Mount Mitchell to Mount Craig. 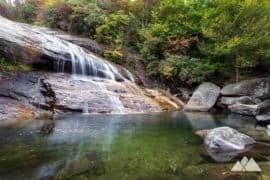 Two waterfalls, beautiful views from the trailhead and miles and miles of rolling terrain filled with wild blueberries and blackberries: it’s no wonder that Graveyard Fields is one of the Blue Ridge Parkway’s most popular hikes. 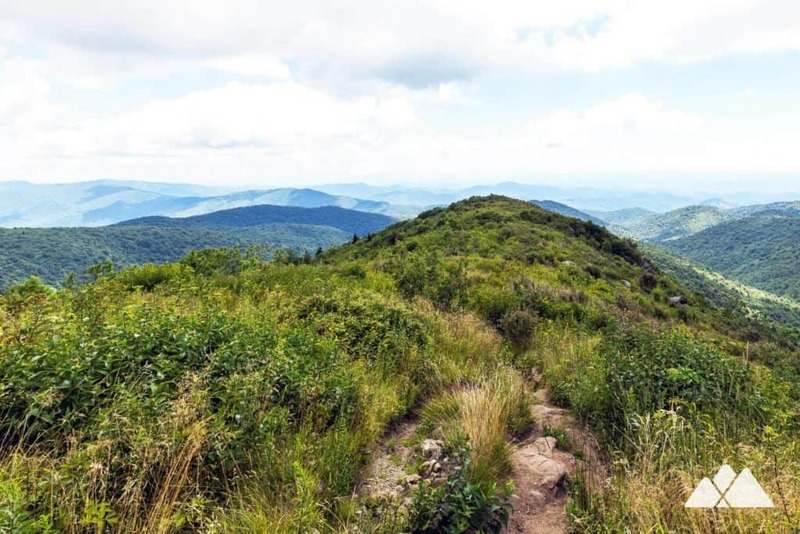 Hike to some exceptional Sam Knob summit views, trekking through a wide, open meadow filled with wildflowers, from a trailhead off the Parkway near Black Balsam Knob. Hike to a popular summertime swimming hole south of Asheville, where a multi-tiered waterfall spills into deep, crystal-clear pools in a beautiful, shady cove at Skinny Dip Falls. 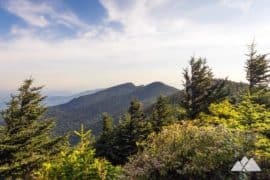 Hike through a beautiful, rocky, high-elevation spruce fir forest, climbing to several overlook views and exploring a forest filled with moss, wildflowers, and sweet-scented air. Rising 6410 feet, Richland Balsam Mountain is the highest point on the Blue Ridge Parkway. 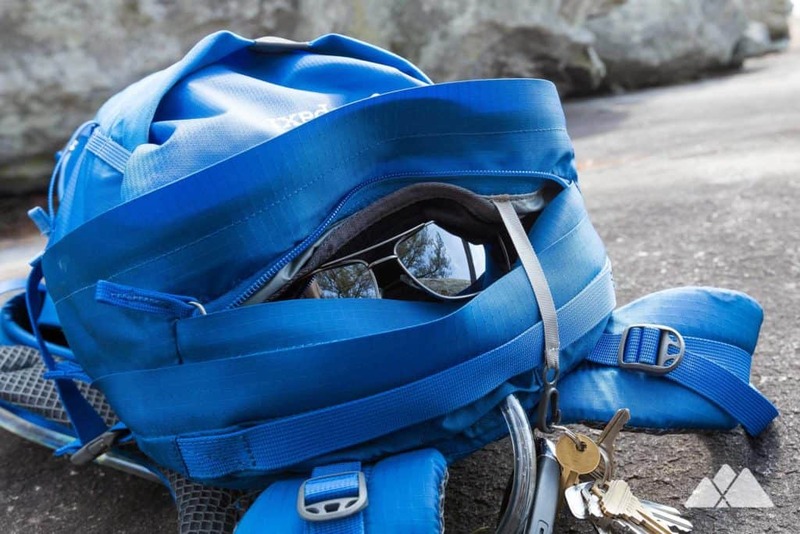 Climb two summits, hike five miles and catch many epic views. 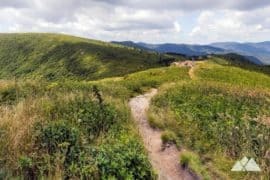 This loop hike is one of the Blue Ridge Parkway’s most scenic, trailing over the grassy bald mountaintops of Black Balsam Knob and Tennent Mountain. Hike a scenic stretch of the Mountains to Sea Trail at Bull Gap, climbing to a beautiful view over the Blue Ridge Parkway. 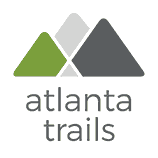 The trail explores the scattered remains of Rattlesnake Lodge, an early 1900s summertime estate, including the foundation of a barn, a lodge, an old spring house, swimming pool, and outbuildings. 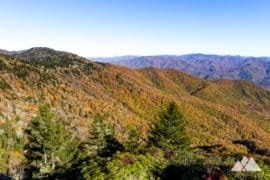 It’s a fantastic hike in any season, but extremely beautiful in autumn, when the forest’s fall leaves drop in abundant color. 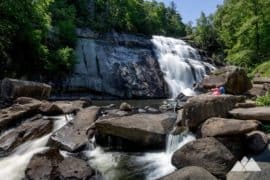 Hike this just-off-Parkway trail to up-close views of the Linville Falls waterfall, trekking to the Plunge Basin Overlook and the Linville Gorge floor. 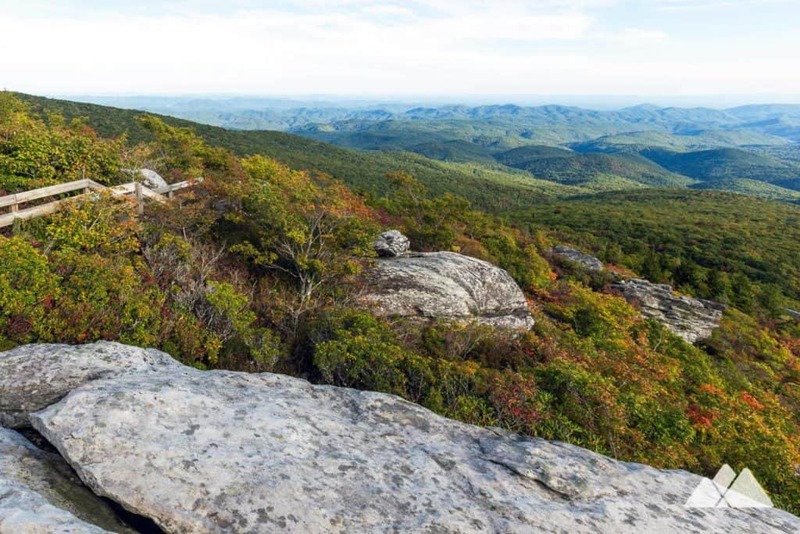 Hike the Art Loeb Trail from Black Balsam Knob, rolling elevation over grassy, wildflower-covered balds into the Shining Rock Wilderness. 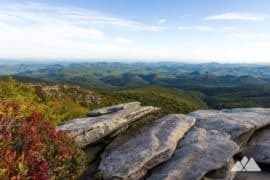 The final destination: the summit of Shining Rock, which offers stunning views from enormous, white quartz boulders and rock outcrops. 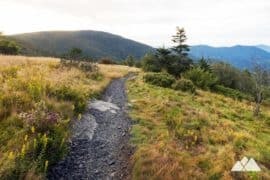 It’s one of the Blue Ridge Parkway’s best: hike the Art Loeb Trail to the sun-drenched, grassy summit of Black Balsam Knob, climbing through a forest of sweet-scented black balsam fir. Hike a loop at Graveyard Fields, one of the Blue Ridge Parkway’s most popular hiking destinations, to ridgeline views, two waterfalls and through fields of wildflowers, wild blueberries, and blackberries. 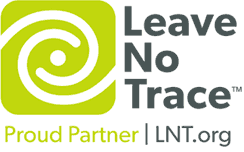 It’s a short climb from the Blue Ridge Parkway, but so worth the effort. 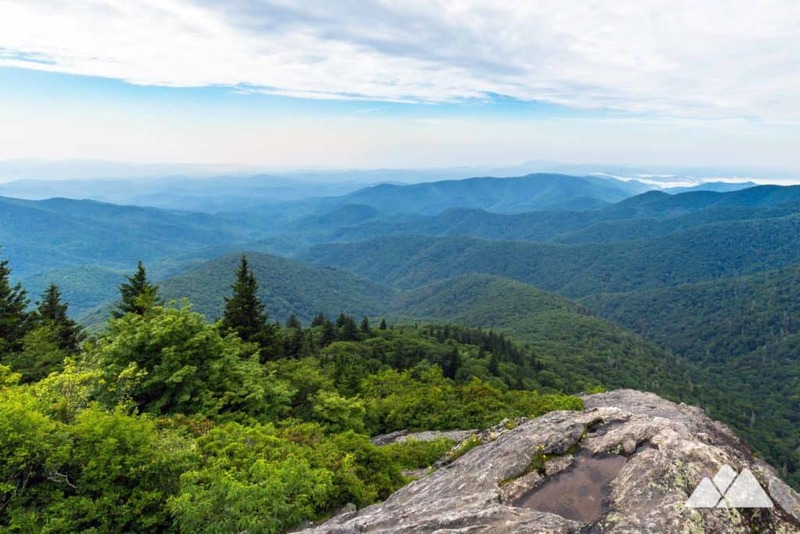 Hike to the towering, jagged Devil’s Courthouse summit through a beautiful high-elevation forest to catch some stunning summit views from the top. 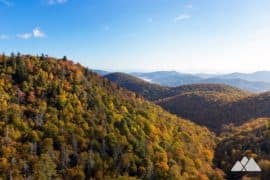 Hike the Mountains to Sea Trail from Devil’s Courthouse, catching stunning view after stunning view from steep overlooks above the Parkway. 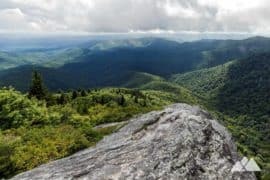 The trail crosses through fragrant balsam fir forests, passes towering rock overlooks and spans wildflower-covered outcrops en route to the grassy summit of Black Balsam Knob. 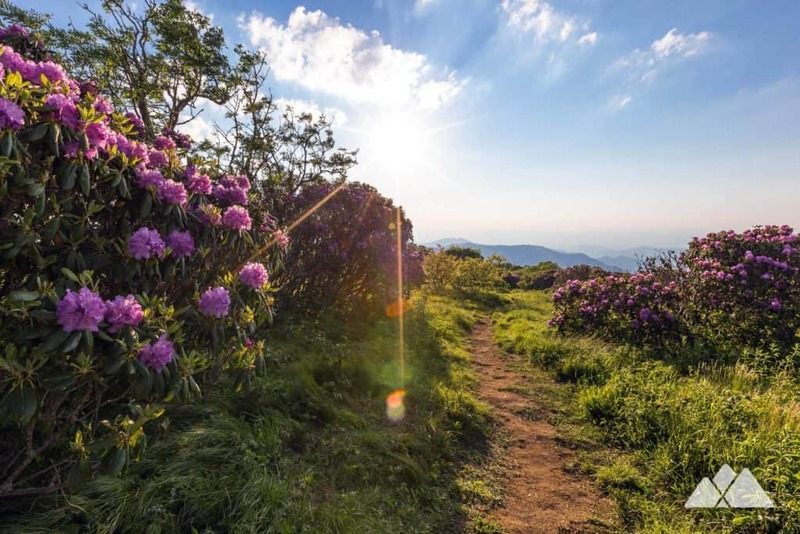 Our favorite Craggy Gardens hike climbs to gorgeous 360-degree views, hiking through a mossy, lush, green forest of gnarly-branched rhododendron. 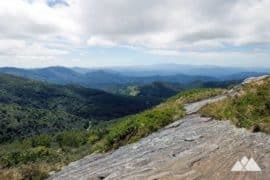 Just south of Mount Pisgah, the Fryingpan Mountain Tower Trail summits a mountain and climbs a historic steel fire tower, catching some stunning 360-degree panoramas.